Research in our laboratory focusses mainly on the molecular basis of prostate cancer progression. The central question in our research is how distinct cell types signal to the epithelium to contribute to the transformation of prostate tissue. Carcinogenesis has been coined as a "caricature of development", meaning that many hallmarks of cancer development, like differentiation, proliferation, apoptosis and invasion, are also seen in normal organ development. These processes are all modulated by signals from the environment, and changing cell types in this environment are a key factor. 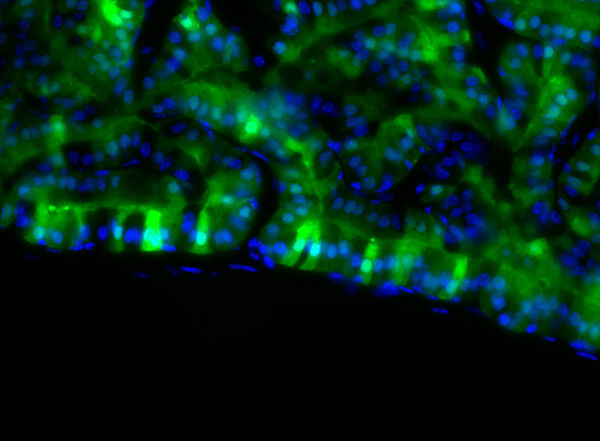 Although our current projects focus on specific questions, the final goal is to understand the tumorigenesis of the prostate by exploring cellular function in health and disease. Our past work in inflammatory signaling has led us to a project on the role of inflammation in prostate tumor progression. Other projects include work on inflammatory diseases of other organs such as the skin, as well as genetic work on different transgenic mouse strains. This page was last edited on 22 August 2011, at 12:58.